Mary H. Ingham of Philadelphia, PA and graduate from Bryn Mawr College in 1903, was Chairman of the Pennsylvania Branch of the National Woman’s Party (NWP), and was arrested three times for picketing the White House. The Bryn Mawr Alumnae Quarterly of November 1917 commended the sacrifice she made in picketing the White House and serving her term in the Occoquan Workhouse in Lorton, Virginia. At a meeting at her house after her release from prison over $8,000 was raised for the NWP suffrage campaign. She was dedicated to the suffrage cause and the NWP as her consistent participation shows. Besides picketing in 1917, she spoke at the event in Lafayette Park on December 16, 1918, when the NWP burned President Wilson’s speeches on democracy to show his hypocrisy towards democracy for women. Mary Ingham burned a speech in which he said, “There is nothing in liberty unless it is translated into definite action in our lives today.” She commented as she tossed the speech into the flame, “In the name of the women of Pennsylvania who are demanding action of the President, I consign these words to the flames.” She participated in the continuing watchfire demonstrations in front of the White House burning the President Wilson’s words, which began shortly after the event in Lafayette Park. On February 9, 1919, two days before a date set for a vote on the 19th Amendment in Congress, Mary Ingham was at the front of a procession of 100 women near the White House, and with Mrs. John Rogers carried a banner which read: “. . . For more than a year the President’s Party has blocked suffrage in Senate. . . . The President is responsible for the betrayal of American Womanhood.” She was arrested that day along with many others. Shortly afterwards, she was part of the nationwide speaking tour by those imprisoned. This train tour, known as the “Prison Special,” was designed to build pressure on the Senate to pass the Amendment. 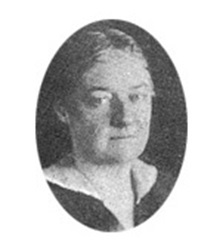 After the 19th Amendment was passed by Congress, Mary Ingham in her role as NWP Pennsylvania state Chairman was a leader in the ratification campaign in that state. The difficult campaign enlisted the aid of the Governor to help persuade opponents, and every legislator was lobbied. She effectively applied the forces of the Pennsylvania NWP, using press bulletins to keep newspaper attention, and drawing crowds at meetings and legislative sessions. The tri-color badges of the NWP could be seen everywhere in the Capitol. Following the Pennsylvania ratification vote, a celebratory parade of the tri-color banners marched through the capital city, Harrisburg. But Pennsylvania was not her only ratification venue; she participated in a protest at the 1920 Republican National Convention in Chicago to bring pressure through the Party to persuade the Republican governors of Vermont and Connecticut to ratify. Her banner read: “The Republican Party has the power to enfranchise women. When will it do so?” Following the nomination of Senator Warren G. Harding as the Republican Presidential nominee, she and others met with him to urge pressure on Republican states to ratify, but to no avail. She was active in the Women’s Trade Union League and an investment broker. Sources: Bryn Mawr library exhibits, “Bryn Mawr on the Picket Lines, the Radicals and Activists;” Up Hill with Banners Flying, Irwin, NWP, 1964; and Jailed for Freedom, Stevens, 1995.